My second Jalie 2921 Scarf-Collar Knit Top. Pros: It fits great! Also: Polka dots. Cons: The fabric is flimsy, see-through and not really all that stretchy. Also: My serger and my sewing machine hate me. Also: I forgot to match the dot pattern at the center seam. A few months ago between bouts of illness, my parents took little Z out on a Saturday and I vowed that I would actually sew—something fun, something simple, a quick tried and true pattern requiring no adjustments. Yeah, so, that didn't work out. I don't know about you, but every time I get my serger and sewing machine out of storage after a long hiatus, they grump and crank and sulk and refuse to do a single thing I ask of them, toddler-style. So I spent five minutes adjusting the pattern (I wanted to make the three-quarter version this time), three hours swearing and crying over my serger as I rethreaded it twenty times and it kept eating needles... and maybe an hour or two actually constructing the top. When I finally made my way over to the sewing machine, the revolt had spread—the cheapo flimsy fabric (a discount Fabric.com rayon-spandex blend) refused to take a twin-needle hem, and I just gave up. I wore the top unhemmed to the Brooklyn BurdaStyle Sewing Club the next day, but I didn't feel good about it and I certainly wasn't going to show YOU all. Last night I was finally feeling perky enough to wrestle with the machine again, and I finally managed to get the thing hemmed—it's just a narrow zig-zag stitch, but it's barely visible and it works fine. Sadly it is rather see-through, so while I'm showing it here untucked, I'll probably need to tuck it in and wear it with a cardigan at work so you can't see my skirt or pants or bra straps through it. Here are the details again—a bit abbreviated, since I've already made it (blogged here). Fabric: A cream and red polka dot rayon/poly/spandex blend from Fabric.com that I probably should have just returned when I received it but didn't bother. Flimsy, thin, see-through, not much stretch and wrinkly and rumply. The original description read "This stretch jersey knit fabric has an ultra soft hand, a beautiful drape and about 40% stretch across the grain for added comfort and ease." Um, no. It does NOT have 40% stretch... and it's not all that soft compared to other rayons I have know and loved. Whatever. Pattern alterations or any design changes you made: Did a cheater width FBA (see above link in sizing), took in the waist by an inch and added half an inch to the length, too. Construction notes: All seams done on serger, and the hem and sleeve hems narrow zig-zagged on my conventional sewing machine with a ballpoint needle. 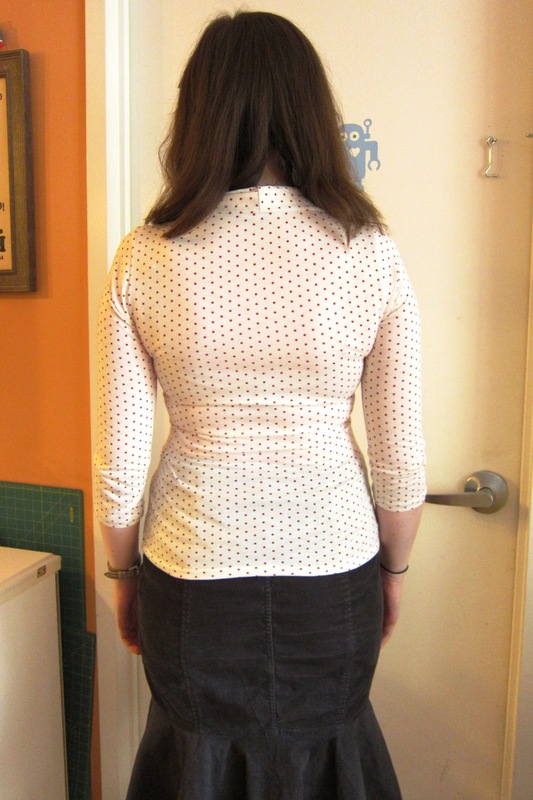 Shoulder seams stabilized with 1-inch strips of self fabric. I actually sewed something I can wear for the first time in MONTHS. Don't forget about pattern matching. Cheap fabric just isn't worth the trouble. I have so little precious sewing time, and I have many nicer fabrics in my stash—I just need to get over my fear of destroying them. I learned this with knits a while back—if I'm going to spend a year knitting a sweater, I'm not going to use cheap plasticky acrylic yarn. Would you sew it again? Would you recommend it to others? Yeah, done and done! Wear to: Work (with a cardigan), home, weekend, mommy stuff, whatever. Top: me-made, tie-neck knit red and cream polka-dot top (Jalie 2921), rayon/poly/spandex from Fabric.com. Green Cat Eye Glasses: Bevel. Side photo note... I originally tried taking all the photos near the window in front of my polka dot couch, but the background was so distracting I gave up. It's the same couch I've always had, but my mom covered it for me (in less than a day!) with some other Fabric.com fabric since I was getting sick of the floral print. OK, I'm off to the Colette Patterns cocktail party at Brooklyn General that starts in ... half an hour! See some of you there? 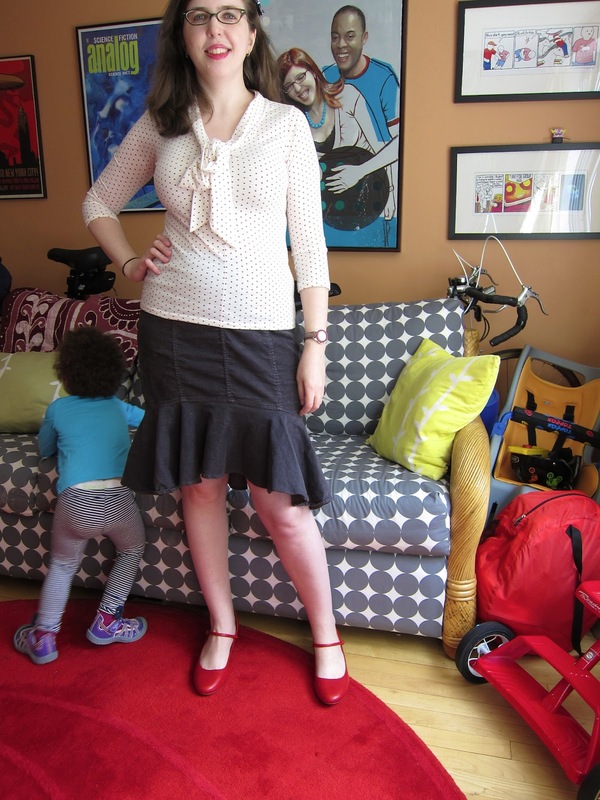 I love the photo second from the bottom: you look like Superhero Mom! Glad you're able to get sewing again, even if the results aren't all that you'd hoped. I love it! Too bad the fabric was such a bummer, but the top looks great. YOu really nailed the fit. I wore my polka dot version so much I wore holes in the fabric. Such a wardrobe workhorse! Thank you all! Yes, my apartment is usually a disaster, and the only place we have to store our bikes is behind the couch. That's life! Very stylish top! Oh that last photo is so cute and funny. This looks great! 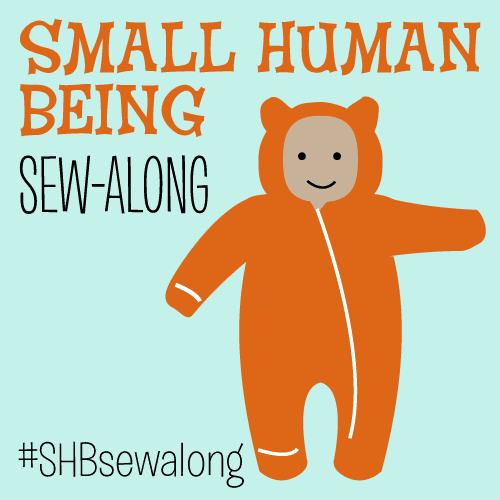 Hopefully it gave you the confidence that you need to cut into some of your nicer knits! I'm so glad you and the wee one are slowly feeling better, and you are back to sewing! Yippee! It's nice to have a little extra energy at the end of the day for being creative, isn't it? I think i own this fabric in black... and i agree, it's crappy quality! Still, looks cute! The top is cute, what a bummer about the fabric. FWIW, I've found a dark cami under a slightly sheer top works nicely with dark bottoms (so there is no obvious "and now you can see my pants" portion of the top). Oh my goodness, why did I NOT think of that? I use that trick all the time with other clothing items... Perfect! I like the top! Very frustrating about misleading fabric descriptions, but it still turned out well! 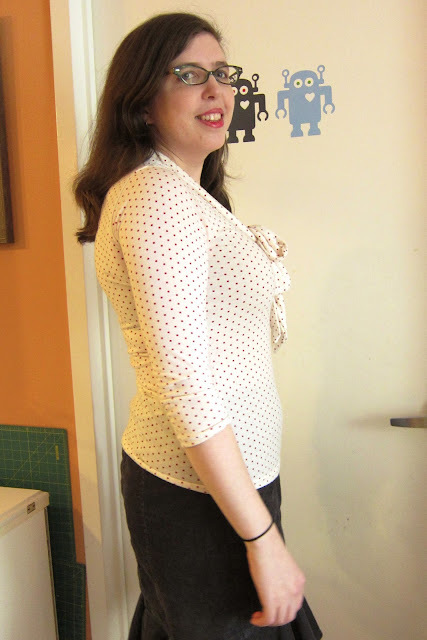 I have the same issue with a lot of thin, light-colored tops over dark bottoms, but cardigans and/or camisoles usually save the day. Oh nice! 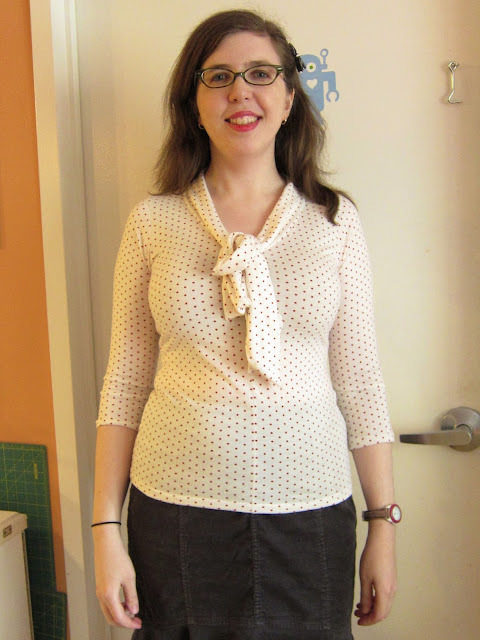 I love bow front blouses but the one I made is a woven and a bit uncomfortable. This one looks much easier to wear! Hi Mikhaela, I'd love to know more about using a bias strip of self fabric in the seam. Sorry if this is a silly question, but do you just put it on top of where you intend to sew and then sew the three layers?